Be Careful of Cheap Carpet Cleaners | What Does Carpet Cleaning Cost? The old adage “you get what you pay for” applies to carpet cleaning too. If you choose to hire cheap carpet cleaners in Fort Wayne or rent machines from the grocery store or hardware store, be careful. You might end up paying more in the long run. If you see a carpet cleaning company advertising extremely low prices, you should expect an extremely low level of quality. You should also anticipate the possibility of intense upselling during the service as well as the potential for “bait and switch” tactics since it isn’t profitable for a carpet cleaner to run their business at the low prices advertised. In terms of the service itself, a cheap carpet cleaner probably uses a carpet shampooer and excessive amounts of soap and water. That method of cleaning is more cost-efficient for a one-man operation, especially one selling their service for “too good to be true” prices. Initially, a carpet shampooer and detergent solution could create a sheen on the carpet that looks nice, but that sheen indicates that soap and detergent have been left behind in the carpet, which is bad. Soap left behind in carpet creates a residue that attracts and compounds new dirt and soil. The reason some feel that carpet cleaning makes carpets dirty faster is because the service they hired left soap in the carpet fibers. Increased soiling in carpet expedites wear and once a carpet wears down, you cannot restore it, only replace it. As you are aware, the cost of installing new carpet is much pricier than even the most expensive or best Fort Wayne carpet cleaning company. Another cheap carpet cleaning service is to rent a machine yourself. This DIY method appeals to frugal homeowners but it too comes with many risks. If the rental machine is used incorrectly damage to your carpet or the machine could occur. If you damage the machine you have to pay for it’s repair or replacement. If too much soap or chemicals are added to the mixture you can cause immediate damage or discoloration to carpet. The carpet cleaning rental machine uses heated suction too that could singe carpet fibers and the metal can catch and tear loose strands. There is also the potential for physical harm since using carpet cleaning equipment is extremely labor intensive. Most carpet cleaning machines are very heavy to so be careful lifting and moving the equipment around your home or in and out of your vehicle. Our recommendation is to avoid cheap carpet cleaners and DIY rental machines and trust the professionals at Chem-Dry of Fort Wayne. Our technicians are trained and certified in the latest equipment and innovation from Chem-Dry laboratories. We use only green-certified cleaning solutions and low moisture for our carpet cleaning. The process itself is approved by The Carpet & Rug Institute and carpet manufacturers around the globe. We aren’t the cheapest Fort Wayne carpet cleaning company but we are confident you will love the service and the results. And, we offer several online specials to lower our carpet cleaning prices. 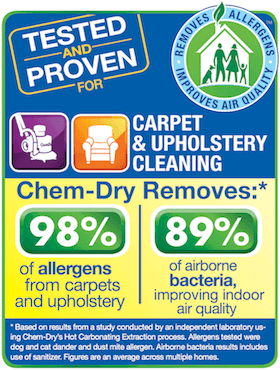 Call Chem-Dry of Fort Wayne today at (260) 409-1138 to schedule an appointment. You will be thrilled you did!